Known for his organic and soft lines in designs like the Swan™ and the Ant™, Arne Jacobsen surprised design connoisseurs all over the world when he first introduced Oksen in 1966. Reflecting its name – meaning ‘the bull’ in Danish – Oksen was big, bold and powerful. All three features characterise Oksen in 2017, as we relaunch this outstanding yet somewhat overlooked Arne Jacobsen furniture piece. To make any lounge setting superior – in a private home or a corporate office – we introduce Oksen™ by Arne Jacobsen. Unlike many of Arne Jacobsen’s other designs, Oksen was not designed for a specific architectural project. It was a product of years of experimenting by Arne Jacobsen. The chair was considered quite rare among critics due to its short original production period as well as its controversial yet powerful expression. The voluminous Oksen represents edge and personality and like its predecessor – the Egg™ – it inhabits a room like no one else. It took Arne Jacobsen nothing less than five years to develop the Oksen design. In contrast to many of his earlier pieces that are characterised by rounded, organic shapes, this easy chair has a much sharper outline. Arne Jacobsen always wanted to surprise the public and Oksen was a project he repeatedly returned to with many variations in the years 1962- 66 before it finally took shape in 1966. Indeed it can be defined as the largest and most distinctive chair that Arne Jacobsen ever designed. 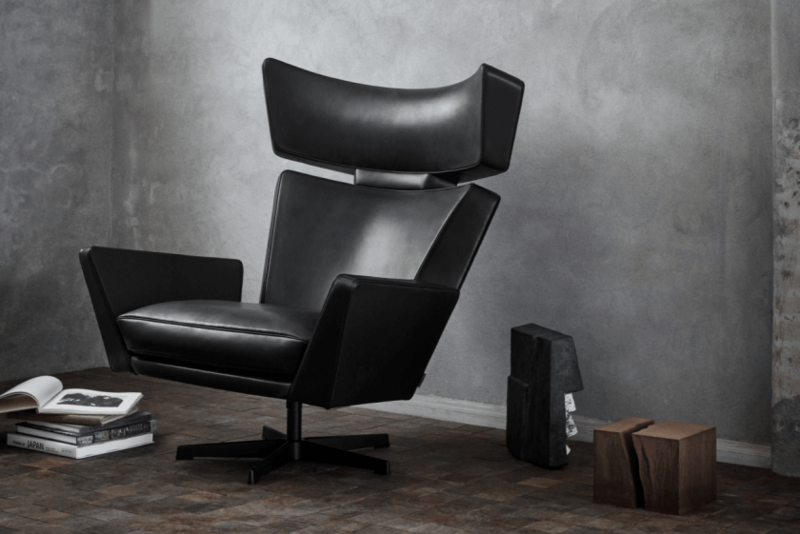 The chair is both distinctive and definite in its language, and the inspiration is clearly the American recliner type that Jacobsen had seen in the United States. In addition, it can be seen as a counter reaction to the perception of Jacobsen as a designer who previously worked with a soft sculptural form. Oksen is also sculptural but in a completely different tight form and designed in a style that is in line between the soft royal furniture and the tighter Oxford™ furniture in Fritz Hansen’s collection. Available from our store: October 1st 2017. Available to order from: June 1st 2017.